Ancient Stones - Borders - 076 Turn-Again Stone, Skirmish Hill, Melrose. The Turn Again Stone is a solitary standing stone measuring 0.45 x 0.45m on plan and 0.85m high and is comprised of local sandstone. 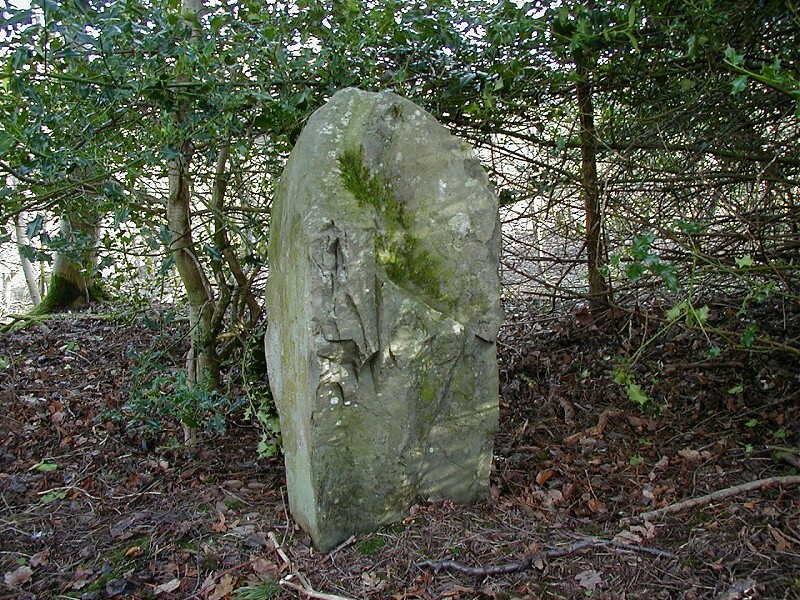 The stone is well hidden in woodland adjacent to Kaeside Farm on a ridge overlooking the village of Tweedbank. The stone stands immediately adjacent to an ancient trackway, barely visible inside the woodland. From Melrose town centre, follow the B6394 towards Darnick. Inside Darnick village, turn left along a minor road leading to Sunnyside Farm (not signposted). Continue until Kaeside farm. The stone is located in the woodland to the north near the grain silo. Please ask permission at the farm before walking to the stone. There is limited parking on site in the farmyard but please ask permission first. The Turn Again Stone is believed to have been set up around 1526 at the time of the Battle of Melrose on nearby Skirmish Hill. The Scott family and others, who were fighting for the release of James V, were defeated by forces led by Ker of Cessford. Ker led the following pursuit but at the site of stone, Elliot turned and speared Ker to death. The stone marks this spot. Despite the folklore generally agreed to be associated with this stone, it is possible that the stone pre-dates the Battle of Melrose in 1526 as it stands along side an old trackway that may have led to the crossing point or ford over the River Tweed at Abbotsford. 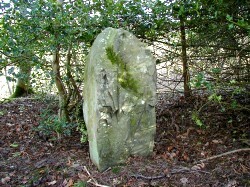 A similar example of this type of mark stone can be found at 005 Standing Stone, Cardrona, Peebles. Also of interest at this location, is the abundance of holly, a tree with many associations to pagan rituals and witchcraft. This stone is not marked on current Ordnance Survey maps.